On Monday, July 16, Tibetan Buddhists celebrate the first “turning of the Wheel of Dharma,” the occasion when the newly awakened Buddha gave his first teaching and brought the Dharma into this fortunate age. After the Buddha attained enlightenment under the Bodhi tree, he pondered that his realizations—his Dharma—was profound and not easy to understand. He wondered if sentient beings were actually ready for his teachings. It is told that the god Brahma requested the Buddha to teach, saying there were beings “with little dust in their eyes” who could understand and benefit from the Buddha’s teachings. Responding to Brahma’s request, the Buddha thought about the five ascetics who had been his companions when he was immersed in ascetic practices. The Buddha thought they had the potential to understand what he himself had understood during his awakening. The Buddha found his old companions in Sarnath. There he gave them the first teaching; the first turning of the Wheel of Dharma. He spoke of the Four Truths of the Aryas: True Dukkha, True Origins, True Cessations and True Paths. This first teaching constitutes the overarching structure within which all Buddha’s teachings can be categorized. Wheel Turning Day is a very auspicious occasion to engage in virtuous action. The merit of every virtuous action done on this day is multiplied 100 million times. Early Monday morning, take the 8 Mahayana Precepts. Watch Ven. 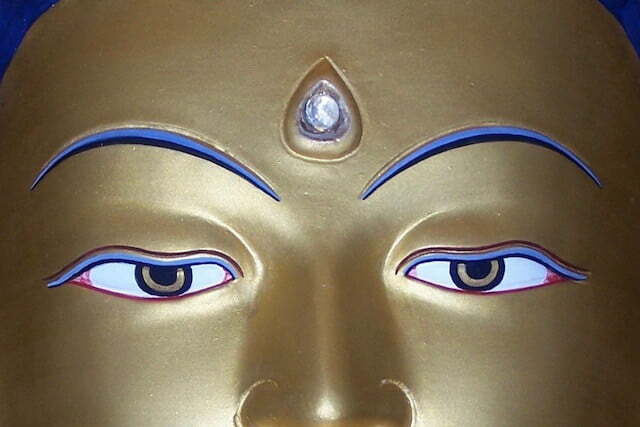 Chodron’s introductory teaching on the Four Truths from the Gomchen Lamrim. Continue your study with Venerable’s series of teachings on the 16 Attributes of the Four Truths of the Aryas, which helps us understand our situation in cyclic existence. Make special offerings to the Three Jewels— Buddha, Dharma, and Sangha. Make special offerings for refugees, the homeless, or the hungry. Go here to include Sravasti Abbey in your Wheel Turning Day offerings.